I highly suggest that you buy a bottle of wine before watching The Man with a Cloak. You’ll want it before the film is over. I don’t mean to suggest that you’ll need a stiff drink to make it through the movie. In fact, while no classic, the picture is quite diverting and enjoyable. It’s just that the screenplay extols the virtues of the fermented fruit of the vine with such witty banter that you’ll long for a glass of vino long before the film concludes. 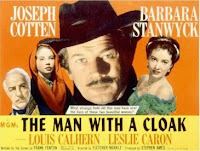 Based on a John Dickson Carr short story, “The Gentleman from Paris,” The Man with the Cloak is the type of story in which a famous author from literary history is placed inside a fictional story that shares some characteristics of the writer’s own work. Joseph Cotten plays the author--a destitute, wine-guzzling, poet living in New York in 1848. While trying to convince his favorite bartender (Jim Backus) to extend him more wine on credit, the writer encounters Madeline (Leslie Caron), a young woman from Paris who has come to America to carry a letter to the grandfather of the man she loves. The old man, Theverner (Louis Calhern), is ill-tempered and ailing, and Madeline quickly becomes convinced that his mistress/housekeeper (Barbara Stanwick) is plotting to kill him. As a favor to Madeline, the writer steps in to play amateur detective, sticking his nose in the family’s affairs and helping himself to a good many glasses of wine from the old man’s cellar. In addition to the mystery at the center of the film, the filmmakers attempt to be twice as enigmatic by withholding the name of the author that Joseph Cotten is portraying until the picture’s end. However, there is little doubt from the movie's outset which famous author Joseph Cotten is meant to be. When asked who he is, Cotten’s character responds, “A man with an empty glass.” He also goes by the alias of “Dupin” which should be a dead giveaway to the author’s identity for anyone with more than a passing recollection of their high school English classes. If that isn’t enough of a hint, the poet’s proclivity for wine, the importance of a pet raven to the mystery, and the fact that the story takes place around Halloween should eliminate all uncertainty. 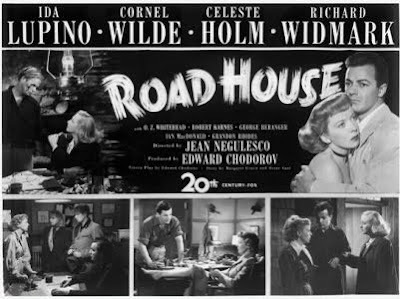 Still, the lack of real mystery as to the writer’s identity or within murder plot itself (the film is framed like a Columbo episode where the audience knows long before the detective what is really going on), doesn’t detract from the enjoyment of this forgotten gem. The writing is witty, the performances are lively (especially by Cotten and Calhern), and there are lots of wine-related gags for lovers of soused cinema. The Man with a Cloak is a small film with modest ambitions, but like a fine wine, it goes down smoothly. A Note--Lovers of old time radio may find additional pleasures in The Man with a Cloak. Like some of the early films of Orson Welles, the film feels a bit like a radio play brought to life. This isn’t surprising because the director, Fletcher Markle, was the creator of the radio anthology series Studio One, as well as one of the writers on Welles’ The Lady from Shanghai (1947). Of course, Joseph Cotten also got his start in radio as one of Orson Welles’ stock company in The Mercury Theater on the Air. Potent Quotables-- THEVERNER: I think we are both drunk enough to be honest with each other. DUPIN: (He downs his drink and holds out his empty glass) Let’s be sure of it. Video Availability--The Man with the Cloak has never been released on video. However, it does air from time to time on Turner Classic Movies. Similarly Sauced Cinema--Pulp novelist Dashiell Hammett is placed inside a fictional mystery (based partially on Hammett’s early life as a Pinkerton detective) in Wim Wender’s 1982 film Hammett.